This article describes the overall gameplay and background information for Brilliant Pagoda or Haze Castle. 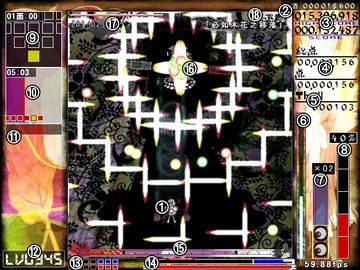 Brilliant Pagoda or Haze Castle plays a bit like a typical Touhou Project game, or rather a typical Len'en Project game, in that the player character always faces the top of the screen, shooting at stage enemies, dodging through intricate bullet patterns and confronting challenging bosses at the end of each stage. However, it also brings a slew of new mechanics to the table that ensure that no two playthroughs will be the same. The game can be played using a keyboard or a gamepad. The Arrow keys (↑+↓+←+→) moves your character around. Z shoots a short burst of bullets. It can be held down for rapid fire. X unleashes a bomb, assuming you have any left. If your flash bomb gauge is full and you are unfocused, it unleashes a flash bomb instead. If armor mode is available, hold the key down until the flash bomb gauge has filled up blue, then release. ⇧ Shift slows down your character's movement speed and changes the nature of your shots, usually by reducing their range and directing them straight ahead. ⇧ Shift+X can still be used to unleash a bomb, assuming you have any left, if your flash bomb gauge is full. Esc pauses the game and brings you to the in-game menu. There are four levels of difficulty to choose from in the main game. Additionally, there are two levels of difficulty for the Extra Stage and Ex+α Stage. 物足りないかも This might leave you unsatisfied. 挑戦しちゃう? Up for a challenge? やめときな Just give up already. Each difficulty level features differences in the rate of enemy fire, bullet pattern density, bullet damage, enemy health bars, and enemy spell cards used. Difficulty also determines the potential quantity of sub-events happening as well as the kinds of sub-events, with more difficult events being more likely in higher difficulties. Previous games had an "Easy Extra" difficulty that's used for those who would prefer to follow on the story, but because upgrades gave simplicity to the overall gameplay, it was removed. A character's "shot" is their primary means of attack. The shot's attack range, behavior and power depend on the chosen main character as well as the current power level and whether or not the player is currently focused. At the start of the game, a line labeled "Item Get Border Line!" appears on the screen for a few seconds. If you move your character above this line, all items currently on-screen are drawn towards them. Bombs (more specifically: spell cards) are a limited-use method for getting out of sticky situations. A bomb's appearance, power, range and duration depend on the chosen sub character, but it typically deals large amounts of damage to every enemy it touches in addition to cancelling out every bullet currently on-screen or fired during the bomb's duration. Characters are also invincible for the duration of the bomb. You start the game with anywhere between 2 and 4 bombs, depending on your sub character. Extra bombs can be obtained by collecting green bomb items, which are dropped by midbosses and end-of-stage bosses. You can carry a maximum of 5 bombs. Dying will reset the amount of bombs to whatever you had when you started the game. Normal bombs look like a black circle with a grey crescent moon. They have no special traits. Power bombs look like a red circle with a black P in them. They are more powerful and also increase your power to max when used. Barrier bombs look like a white circle with a cyan outline and a cyan cross. They reset your barriers to the starting amount. Special bombs look like a white circle with a light grey star in it. They combine the effects of both the power and barrier bombs. What kind of bomb a bomb item gives you is determined at random, but normal bombs have the highest probability, followed by power, barrier, and lastly special bombs. If you get hit by an enemy bullet or an enemy itself, you have a short window of opportunity to use a bomb in order to save yourself. This is called deathbombing. Doing so successfully will prevent you from losing a life. As such, you will only be able to deathbomb if the damage you sustained is enough to empty your life bar. If you lose all your lives and choose to continue, you will automatically use a bomb. This is not deducted from your bomb stack, though. You cannot use bombs as long as the sub-event Bomb Seal (ボム封印) is active. Flash bombs can be used, however. You start the game with 3 lives (2 extra lives) and 2 barriers. On top of that, you have a health meter and a barrier power meter. If you get hit by enemy bullets or run into an enemy, your barrier power meter depletes. Once it has fully depleted, you lose a barrier. If you are out of barriers, you will lose health instead, and when your health runs out, you lose a life. Losing a life does not replenish your barriers. Enabling Instant Death Mode (即死モード) makes health and barriers completely insignificant as getting hit will cause you to instantly lose a life. You start with two additional lives, however, and alcohol gain increases by a threefold (fivefold in the trial version). Your hitbox is very small in comparison to your character, about 6 pixels in diameter or smaller, depending on the character. If you hold down ⇧ Shift, a white dot with a red outline will appear, showing the hitbox's location, but it is not indicative of the actual hitbox size. If your hitbox comes into contact with a bullet or an enemy, you have been hit. In this game, lives are represented by red rectangles while barriers are represented by blue rectangles. Extra lives can be obtained if you clear a cell that has an Extend (エクステンド) sub-event going on without getting hit or using a bomb. 1-up items are dropped by stage 3 bosses and stage 5 bosses, as well as after the first spell card of either extra stage boss. There is no limit to how many lives or barriers you can have: If you have more than 7 lives or 6 barriers, the indicator will simply be represented as colored rectangle x amount of lives/barriers. When you take any damage, your power is reduced by 5%, and when you lose a life, your power is reduced by 15% and 10 small power items are scattered for you to collect. You also become invulnerable for a short period of time. If you lose all your lives, you are given the option to continue right where you left off. However, continuing will reset your score and alcohol to 0. You may continue up to 3 times in the main game. Also, you cannot continue in Extra stage. A barrier will start to regenerate if you can go a full minute without getting hit. Once it has regenerated, the next one will start regenerating a minute after that and so on. The amount of damage a bullet causes depends on its color. From weakest to strongest, the colors are blue, cyan, green, yellow, red, purple and white. Pacifism (平和主義): Your health will slowly regenerate as long as you are not attacking. Dimensional breakdown (次元決壊): Destroys a certain amount of barriers depending on the level of the event. Barrier drain (結界干渉): Your barrier power slowly decreases, but even if it drops to nothing, it will not destroy a barrier. Poison (瘴気): Your health slowly decreases, but running out of health this way will not kill you. Penetration (貫通): Any damage you receive goes straight to your health, even if you have barriers. Directly to the right of the playing field, a vertical bar fills up as you graze enemy bullets. Once it is full, it turns red and a flash bomb can be used by pressing X while unfocused. Flash bombs are a lesser bomb with a duration of only about 1 second and an overall narrow range. Aside from that, flash bombs differ between characters in both range and behavior. They can also be used during a boss's spell card attack without forfeiting the bonus, making them situationally useful. You can only carry one flash bomb at a time. If Taira no Fumikado is a sub character, armor mode is what you will get instead of a flash bomb. Once the flash bomb gauge has filled to at least 50%, hold down X. A blue meter will rise up, and armor mode will be activated once it has reached the top of the bar and you let go of the bomb key. Getting hit or shooting will cause the blue meter to reset. You are completely invincible during armor mode. This system combines three characters to play as one. A trinity consists of a main character, a sub character and a support character. The main character provides the shot type and movement speed while the sub character provides the starting bombs and bomb types. The support character only has meaning if they are equipped with a skill that activates when they are support. Each stage consists of cells. At the start of a cell, you are notified of which enemy formation of which faction you are fighting (the two factions are the Dragonfly Army and the Imperial Military, which can be in one of 15 formations at a level between 1 and 9) as well as any sub-events that may be taking place. A cell can have up to 4 sub-events going on at once. A stage will have pre-determined the cells that contain midbosses. Stepping into one of these will have you face a midboss, rather than an enemy faction. Sub-events can still happen, though. 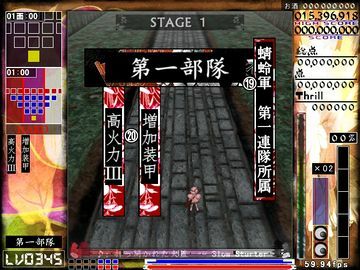 At the bottom of the playing field is the movement gauge, which is divided into three colors: Red (Haze Castle route) on the left, purple (Neutral route) in the middle, and white (Brilliant Pagoda route) on the right. Moving the player character to either side of the screen will tilt the gauge accordingly, and the position of it will determine which cell you advance to next. Stages are divided in red, purple and blue sections, much like the movement gauge itself. The color of the section that the last cell you enter determines which boss you fight and which stage you move on to next. The main challenge of the game. A boss waits for you at the end of each stage. Each boss has multiple health bars, and whenever they use a spell card, a counter appears showing you how many spell cards you have to endure for the entirety of this battle. A boss's attack patterns usually alternate between a normal attack and a spell card, though bosses may use two or three spell cards in a row towards the end of the fight. Normal attacks are typically incrementally stronger versions of a character's basic attack. Spell cards employ much more complex bullet patterns to both bedazzle and challenge the player. If the player manages to deplete a boss's health bar during a spell card attack without getting hit or using bombs, a bonus is awarded. Each attack is accompanied by a timer. When it runs out, the boss proceeds to their next phase, regardless if their health bar had been depleted. Simply waiting out a boss's attacks may be enough to beat them, but it won't award the player any significant score bonuses. The exception to that are spell cards during which the boss is invulnerable. Surviving these without getting hit or bombing will award a bonus just the same. When fighting a boss, a marker will appear below the playing field, showing the boss's position on a horizontal axis. Since the boss may be obscured by their own bullet patterns, this indicator can help the player locate their target. Brilliant Pagoda or Haze Castle has 4 initial teams with 3 characters each to choose from: Yabusame Houlen with Tsubakura Enraku and Shion, Taira no Fumikado with Fujiwara no Iyozane and Tsugumi Umatachi, Tenkai Zuifeng with Sukune Katano and Sese Kitsugai, and Kuroji Shitodo with Hooaka Shitodo and Aoji Shitodo. Suzumi Kuzu, the fifth team, is unlocked by completing the Extra+α stage as every other team. Each character has their own shot type and bombs, as well as different movement speeds. Shot Type Widespread and weak dimensional fragments that slowly fan out. Gains homing lasers at 20% and 60% power. Narrow and strong concentrated shot complemented by nanomachine options that fire directly forward. At 60% power, the red shots are switched with a powerful penetrating laser, but options are lost and must be regained. Narrow pink waves with medium strength. Gains a randomly-firing secondary shot at 20% power. Deals good damage at shotgun range. Bomb Dimensional Detachment: Long duration, harms everything on-screen, intermediately powerful. Monochrome Ray: Short, only hits what's in front of you, massive power. Soul Siphon "Fading Sense of Self": Fairly long, drops in range from screen-filling to a small circle around Shion. Powerful. Flash Bomb Maiden Pit: Clears a small circle around Yabusame. Vertex Emit: Clears in a cross-shape with Tsubakura at its center. Ghost Child "Feral Ghost of Aveyron": Fires a clearing shot in a random direction, making perpendicular "slices" that clear more bullets. Shot Type Fires throwing knives directly forward and at oblique angles to the side. Shot has wide gaps and medium power. Wide range, high power. Screen-filling, very weak. Bomb Dharmatic Power "Myōken of Heaven's Blessing": Short burst in front of Fumikado, then screen-filling from above. Wave Card "Wave of Iyo": Very long duration, screen-filling, powerful. Revolving Life "Lady-Go-Around": Long duration, boosts Tsugumi's movement speed for its duration. Rain of bullets. Powerful. Flash Bomb "Inherited Iron-Body Legend": Armor mode. Uprising "Kampaku Cannon": Circular shot that is fired straight forward from Iyozane. "Cheap Impact": Circles in a cross-like formation. Shot Type Homing shots. Gains options at 40%, 60%, 80% and maximum power for a total of four. These options follow them around and shoot lasers vertically while unfocused and horizontally while focused. Furthermore, the homing shots become more spread-out while focused. Widespread with gaps in-between, weak. Starts out pathetically weak with sporadic bones that have limited vertical range while unfocused. Gains shots at 20% power that fire off at 45° to either side. Obtains a bone spike at 60% power that shoots straight forward when unfocused and to the four cardinal directions while focused. This spike deals ridiculous amounts of damage and becomes faster at 80% and maximum power. Bomb Prime Minister in Black Robes: Longest bomb in the game at a whopping 8-second duration. Screen-clearing. FAEB "Haniwa Bomb": Semi-long duration, range depends on how close to the center of the screen you are. Marrow Cannon "Bone Buster": Takes a second or two to charge up before it unleashes a screen-filling blast that is strong enough to tear through an entire boss lifebar. Corpse Card "Cadaver Heart": Covers entire screen in a hash-like shape. Shot Type Shoots in random directions when unfocused, shoots forward when focused. Weak at first, but becomes highly powerful at maximum power. Options shoot lasers instead of bullets from 60% power upwards. Ice and fire arrows. Depending on whether you're focused or unfocused, one is forward-focused while the other is omnidirectional. Fire arrows explode into fireballs on impact with enemies, the fireballs dealing even further damage. Rivals Sese in terms of shot power. Main shot is straightforward when under 20% power. Becomes slower, bubbly and somewhat less frequent afterwards. Gains 2 options at 40% power and another 2 at 80%. Shots gradually become more frequent. Damage output goes from weak to mediocre. Bomb RNA "Retrovirus": Long duration, low range around the bomb's origin, brutalizes everything it touches. Heat Lance [Minimum]: Shoots a laser towards the top of the screen. Afterwards, the entire upper half is engulfed in flames. Shitodo Card "Blue Storm": Long duration, covers the screen with a whirlpool of bullets. Flash Bomb Negative and Positive: Rectangle in the middle of the screen that flips bullet trajectories. Opposing Wings: Wings of fire and ice that clear an area to the player's sides. Current Wave "Current Blast": Two orbs that spiral up the screen. Shot Type Gathers knives that are released in an extremely powerful burst when the fire key is let go. The burst is circular when unfocused, and directed straight forward when focused. At 40%, 60%, 80%, and maximum power, Suzumi gains options that fire knives straight ahead and automatically lock on to enemies. Bomb The screen detaches inward, and the cell or boss pattern is reset. Flash Bomb Suzumi turns into static for as long as the bomb button is held. Thus, it's possible to flash bomb without draining the entire gauge. 次元決壊Lv1/Lv2/Lv3/Lv4 (Dimensional Breakdown) Destroys a certain amount of barriers depending on the level of the event. 結界干渉 (Barrier Interference) Your barrier power is being slowly drained. Doesn't actively destroy barriers even if the whole bar is depleted. Cancels any attempts of Barrier Regeneration. 援護射撃【敵】 (Cover Fire [Enemy]) Lasers appear at random spots for the duration of the cell. Cannot occur during midbosses. 酩酊 (Drunkenness) Enemies fire random bullet patterns regardless of their formation. Cannot occur on Easy or during midbosses. 増加装甲 (Increased Armor) Enemies take less damage. 装甲劣化 (Armor Degradation) Enemies take more damage. Cannot occur on Easy. 不死 (Immortality) Enemies are unkillable. Cannot occur on Easy or during midbosses on any difficulty except Unreal, where the timer of the attack is cut in half. 高火力Lv1/Lv2/Lv3/Lv4 (Firing Power) Enemy bullet damage increases. 貫通 (Penetration) All damage taken goes straight to your health. Cannot occur on Easy. 瘴気 (Miasma) Your health is slowly deteriorating. Doesn't actively take away lives even if the whole bar is depleted. 左右反転 (Horizontal Flip) Left becomes right, right becomes left. Cannot occur on Easy. 上下反転 (Vertical Flip) Up becomes down, down becomes up. Cannot occur on Easy. 完全反転 (Complete Flip) All movement controls get flipped. Cannot occur on Easy. 視界不良Lv1/Lv2/Lv3 (Poor Vision) Your field of vision gets reduced. お宝ザックザク (Tons o' Treasure) Enemies drop more items. 酒の亡者 (Alcohol Miser) Your alcohol counter increases on its own. Cannot occur on Easy. 高重力 (Gravity) You get pushed towards the bottom of the screen. 反重力 (Anti-Gravity) You get pushed towards the top of the screen. 平和主義 (Pacifism) Your health regenerates for as long as you're not shooting. エクステンド (Extend) You will get an extra life at the end of this cell if you can survive without getting hit or bombing. ボム封印 (Bomb Seal) You can't use bombs for this cell. Flash bombs are fine, though. 遅延結界 (Delay Barrier) Bullets (except for lasers) and the player move at half their speed when inside the field. 暗中模索 (Groping in the Dark) The movement gauge becomes black, making it impossible to tell its position. 行き当たりばったり (Haphazardness) The movement gauge becomes inverted and doesn't move. Which direction the player moves at the end of the cell is decided at random. 遠ざかる自我 (Fading Sense of Self) Instead of health or barrier power, the player instead loses a huge chunk of shot power with every hit taken. メラニズム (Melanism) All bullets except for lasers become black. 移動速度ＵＰ (Movement Speed Up) The player moves faster. 移動速度ＤＯＷＮ (Movement Speed Down) The player moves slower. 速度制限[高速] (Speed Restriction [High-Gear]) The player is forced to focus. As a result, flash bombs cannot be used. 速度制限[低速] (Speed Restriction [Low-Gear]) The player is not allowed to focus. As a result, regular bombs cannot be used unless either the player is deathbombing or the option to use bombs while unfocused is enabled. 軍備拡張 (Expansion of Armaments) This cell's army level increases by 1~3. 二重結界 (Duplex Barrier) The midboss's invincibility period at the start of their attack doubles in duration. スリップ注意 (It's Slippy, Beware) The player's movements become like on ice. 大番狂わせ (Giant Sudden Upset) Killing regular enemies drains your shot power whereas midbosses will drop huge amounts of power items when defeated. When bullets are destroyed, they generate grey yin-yang items. These have an initial value of 5 points, but after about a second, each consecutive item collected will increase that value by 5 points, up to a maximum of 1000 points. Blue point items are dropped by enemies and bosses and come in two sizes. However, both have the same value which, unlike the point items in Touhou, is not affected by where on the screen they are collected. The only difference lies in the increase of the point item counter: Small items increase it by 1 while large items increase it by 5. The shot power is converted from a percentage to a decimal number, so if, for example, your shot power is 89%, it will be turned to 0.89 for the shot power bonus. While playing the game, you collect alcohol. This alcohol gets saved up and essentially serves as currency for the upgrade shop. Equipping purchased upgrades and skills increases your level as shown in the lower left-hand corner of the HUD. However, that number exists only for show and has no actual effect on the difficulty. Each character (bosses included) has an upgrade, which have their own level limit. Upgrades apply to all characters. The list of upgrades and their associated characters, along with their effects, are listed below. In order to even unlock skills for purchase, the corresponding character's upgrade has to be purchased to at least a certain level, which is indicated by the locked skill. Playable characters have 3 skills each while boss characters have 1. However, like upgrades, boss skills apply to all characters. Character skills, on the other hand, apply only to the team that character belongs to. Each character skill can apply to main, sub, support position, a combination of two or all three. Depending on which position it applies to, that character has to be put in that position during character select to enable the skill. Most of these unlockables rely on other unlockables to be unlocked. The player can get a different ending depending on the route the player takes. To view Route 1 ending, complete the Haze route by defeating Taira no Chouki. Continues don't matter. To view Route 2 ending, complete the Brilliant route by defeating Ooama no Ake no Mitori. Continues don't matter. To view Route 3 ending, complete any Neutral route. Continues don't matter. To view Route 4 bad ending, complete the True Neutral route by defeating Suzumi Kuzu with at least one continue. To view Route 4 good ending, complete the True Neutral route by defeating Suzumi Kuzu with no continues. To unlock a character to fight in "Practice Start" at a specific difficulty level and for a specific character and type, you must beat that character in the standard "Start" game mode at that same difficulty, using the same character and type. The character will be unlocked even if continues were used. Suzumi Kuzu is a special hidden final boss. To unlock Suzumi, you must beat all final bosses in the game (including playables). This means beating Taira no Chouki, Clause, Yabusame Houlen, Adagumo no Yaorochi, Shion, Tsubakura Enraku, Tenkai Zuifeng and Ooama no Ake no Mitori, re-playing the game at least 8 times. After this, Suzumi can be found on Stage 6:0. To unlock the Extra stage for a specific Team and difficulty, you must unlock and beat Suzumi Kuzu, along with the requirements as mentioned above. To unlock Absurdly Extra Mode, you must unlock and beat Suzumi Kuzu on Unreal mode with any team. This will unlock AbEx for any team that has defeated Suzumi on any difficulty. To unlock the Extra+α stage for a specific Team and difficulty, you must encounter and beat all three Extra stage bosses, that is Xeno a, Haiji Senri and Yago Ametsukana. After this, it will be possible go into the Extra+α stage whenever you defeat Xeno a in the neutral route. To unlock the secret fifth team, you must complete Extra+α with the four other teams (can be done on Absurdly Extra as well). Doing this also unlocks the final character in the upgrade menu. To unlock the option to create a custom team from any of the 13 characters, complete Extra+α with the Secret Team. This is the absolutely last unlockable feature in the game. The dialogue when using a custom team is dependent on who the main character of the team is (for example, if Shion is the main character, the dialogue will be the Shrine Team's). ↑ Spelled in a phonetic way to capture the hiragana spelling of the word "fire". This page was last edited on 13 October 2018, at 12:28.